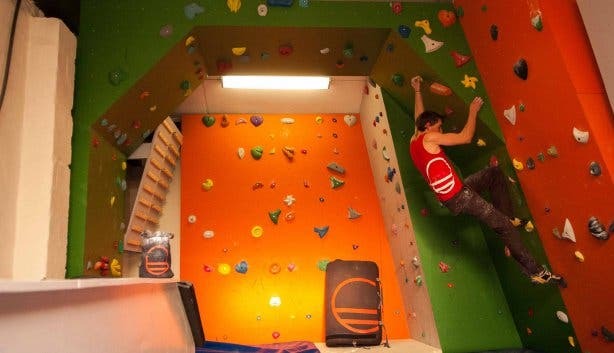 I’ve just walked into HangTime Gym, Cape Town’s latest addition to the indoor rock climbing scene. Natural light pours into the large windows, illuminating the gym in a serene glow. I’m early for my interview with Gareth Cotten, founder and owner of HangTime (among a plethora of other companies), and his two assistants (Ali and Matthew) decide that a practical introduction is in order. “Give me an easy one. I’ve never done this before.” I say, trying to hide my anxiety with a nervous chuckle. They immediately diffuse my anxiety with a warm smile and a few words of encouragement. “There’s nothing to worry about. We’re with you every step of the way,”. I express some concern about safety and they quickly respond. 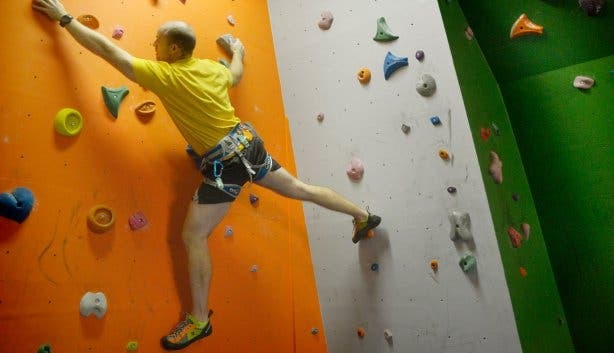 Everything at HangTime has been stress tested by qualified engineers and the facility has been laid out with the help of highly experienced rock-climbers. If any medical situation does arise, they have a full medical kit on site and Vincent Pallotti, one of the best hospitals in the country, is a mere two-minute drive away. After putting on my harness and climbing shoes (a mere R40 for those without their own climbing equipment) I ask Ali to show me around, trying to prolong the inevitable climb as long as possible. 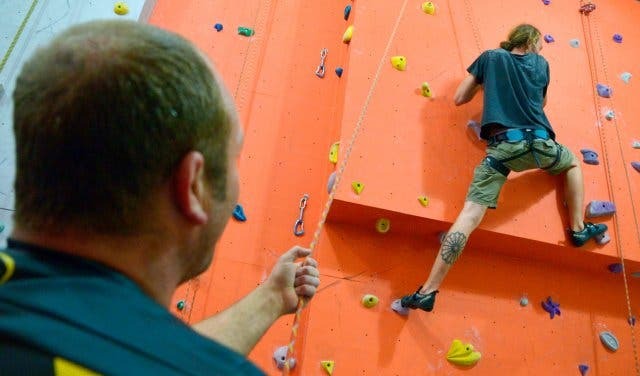 She tells me how they have created this place to accommodate climbers of all skill levels, from total beginners to veterans. Firstly, there are the main climbing area. Two high walls face each other, connected by safety mats at the bottom and a vertical climbing section at the top. They are adorned in strange shapes (grips) of various colours. Each colour represents a route with a specific difficulty level. 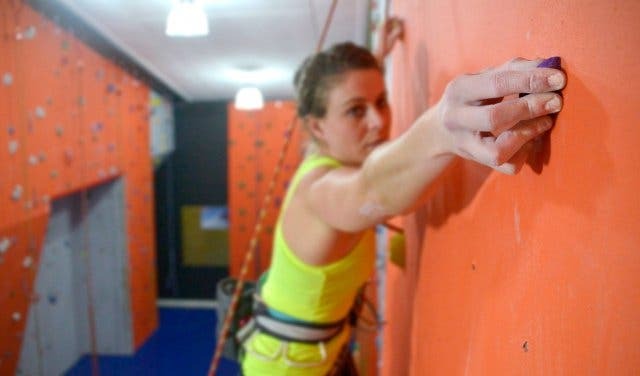 Some of the routes boast easy-to-grasp grips that will require a bit of hand strength to climb. Finally, I’m shown the outdoor wall. “This is where the big boys come to play” Ali says with a mischievous smile. The outdoor wall is a 13m monster, currently the highest of its kind in Cape Town. 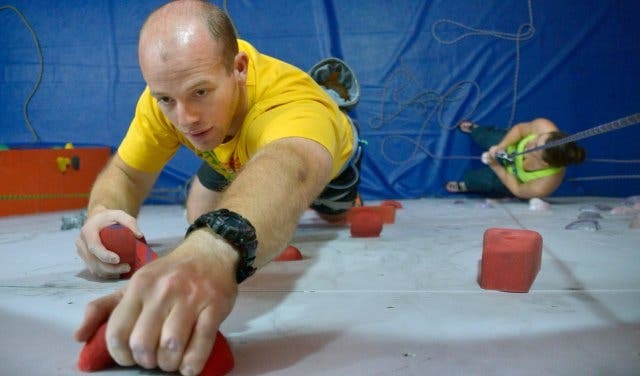 This is where experienced climbers train themselves to handle different weather element, which perfectly slots in with the Mother City’s unpredictable weather pattern. But now the time has come for me to climb. We are back at the initial climbing area and by now everything looks a little less alien. As I start to ascend the wall, I instantly feel my worries drifting away. My only thought is what my next move should be. I enter a state of mental serenity, a meditation of sorts. As I reach the top, I am suddenly filled with a sense of accomplishment and a wide grin spreads across my face. I abseil down (probably my favourite part of the experience) and as soon as my feet hit the ground I start to climb again… and again… and again. 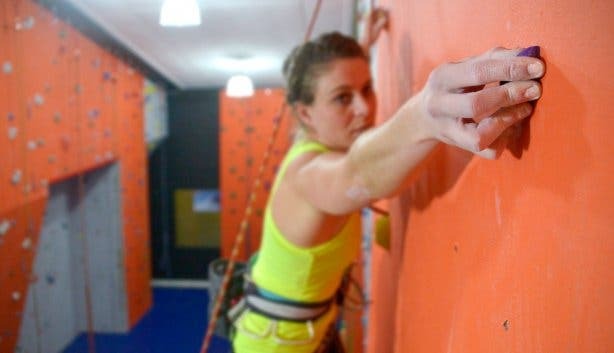 Within my first few climbs I have become totally addicted. HangTime Gym has been an amazing experience. The staff are knowledgeable and friendly and the environment feels calm and safe. I would recommend this to anyone who is looking for an alternative form of exercise or just wants to have some fun. I will definitely be back soon. They also have plans to make it a nationwide chain with their next gym opening in Durbanville as soon as the end of May. Watch this space, big things are coming. Tip: HangTime Gym is one of very few places that offer “Inversion Therapy”. It’s an ancient Greek practice of being suspended in a slightly or fully inverted position, allowing therapeutic traction to take place. In short, it takes the pressure of your body, improving your blood flow and accelerating your healing. In our predominantly sedentary lifestyle, the pressure of gravity weighs heavily on our spines and this therapy is incredibly effective why of countering it. Inversion Therapy will only set you back R150 for 30 min and it is well worth the experience. 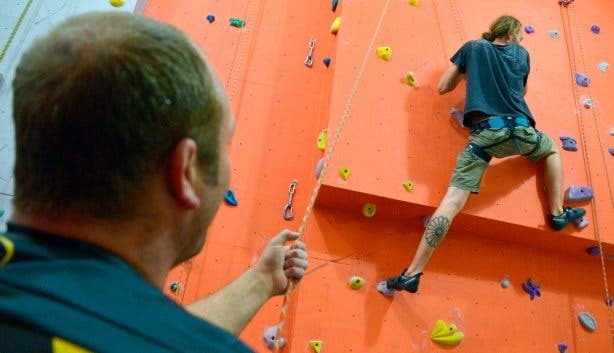 The Bill: HangTime Gym is considerably cheaper than its competitors and all monthly memberships include unlimited climbing for 7 days of the week. 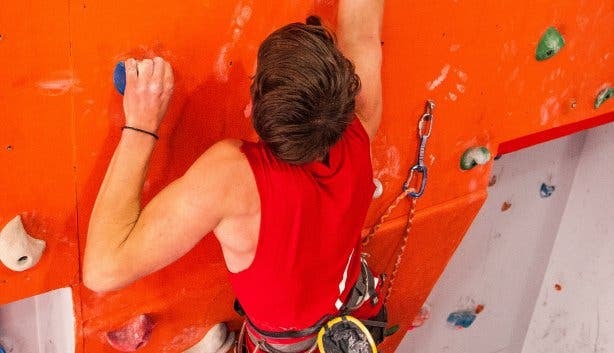 If you don’t have your own climbing equipment (harness and shoes) then HangTime can sort you out for a mere R40.